We’re excited to announce another incredible upgrade for our Contact Center account users! We’ve just made it possible for users of Contact Center accounts to view and manage large volumes of agent activity. Now, the Agency Dashboard screen can be toggled into Manager Mode. What’s that? It’s a condensed format that displays the activity of your group of agents in the top half of the screen, while the bottom half of the screen will show a card view of each of the agents in your pool. Clicking on an individual agent’s card will pop out a panel on the left that displays all of that individual’s activity. Not only will you be able to view all of the statistics you’re used to at a glance – breaks, missed calls, active calls – you’ll also be able to scroll through a list of their last five customer interactions. 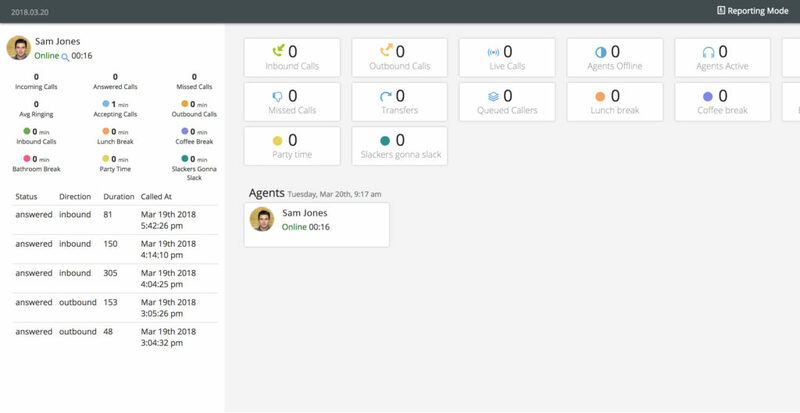 Best of all, a manager can interact with an agent’s call while browsing on the Agency Dashboard page! When an agent is selected and on an active call, a series of familiar icons will be available to their manager in the individual agent’s panel: Live Listen, Barge, Coach, and Drop Call. Feel free to listen in and watch the dynamic audio flow through, barge into the call, coach your agent on the best way to handle their interaction, or enter your password to force their call to end. It’s everything a manager needs to monitor and assist their pool of agents, all condensed within the Reporting tab. If you manage more than one group of users, no problem; a button on the upper left enables you to toggle between groups of agents and check each one’s activity and statistics. Just visit your Phone Settings tab to ensure your managers and agents are grouped into the pools that work best for your call center.